SAEMAS is the Water, Wastewater and Environmental Independent Agency of Sertãozinho, a municipality in the countryside of the State of São Paulo, in Brazil. The agency is responsible for exploring and operating the water and wastewater utilities in the location. 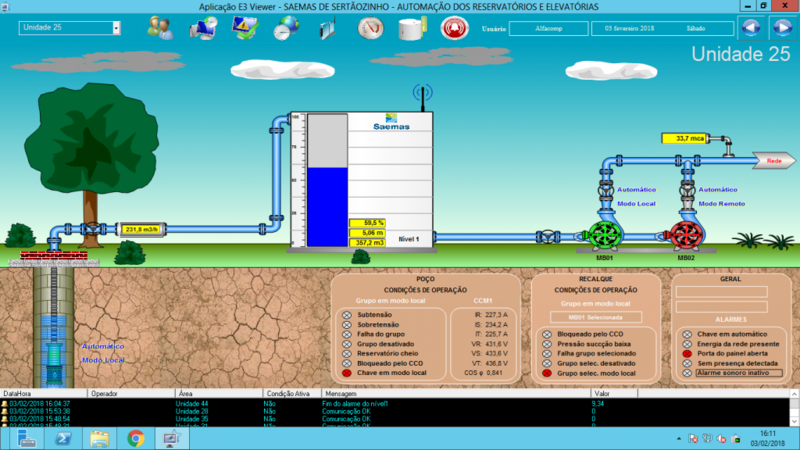 In order to automate the water supply system in Sertãozinho, SAEMAS has adopted Elipse E3, the automation solution provided by Elipse Software. For SAEMAS, the selling point for choosing this solution was how easily it can be adjusted, improved and expanded. The application was developed by Alfacomp Automação Industrial Ltd., and implemented in March 2018. 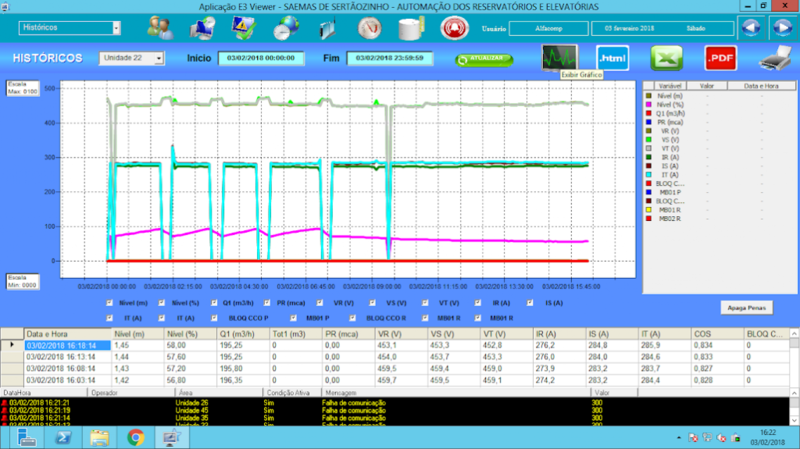 Elipse E3 allows monitoring and issuing commands to all 20 water supply units in Sertãozinho. Each unit comprises one reservoir and three water pumps; these are displayed on the unit’s screen, where the pumps’ water flow, pressure, voltage, and current can be tracked, as well as the reservoir’s water level. The same screen allows monitoring the water pumps’ operational status (faulty devices, service under maintenance, or fully operational unit), and following or resetting their functioning hours. Their default settings for voltage and current can also be monitored with the software; the same can be done to the pumps’ water pressure level in each unit. The same control applies to the water levels in the reservoirs: the system is set up to turn the pumps on or off as needed, thus assuring constant supply and reducing waste. This context of rational water and energy usage allows Elipse E3 to select which stations will be on during peak periods according to system demand. Water levels and flow can be measured either individually at each reservoir or altogether. The amount of flow observed between water wells and reservoirs is also monitored, similarly to what happens to the automation system scan in each unit. At the end of the process, this solution allows issuing reports on the events, history, and alarms from any given period, according to pre-established settings. If an alarm does not meet the expected values (for example, the undervoltage value is below the recommended), the software then fires a visual, audible sign to operators. In addition to reports, the software also allows issuing charts that analyze the units’ performance. Both formats (reports and charts) can be exported to PDF or Excel, and are extremely useful for inspection audit purposes. 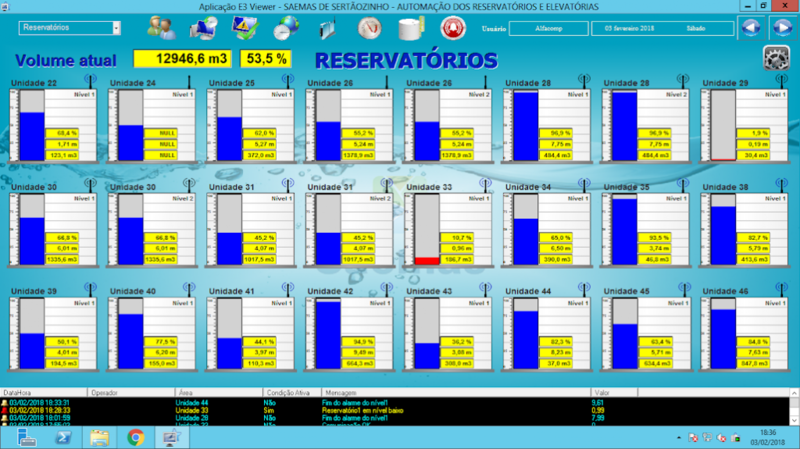 With Elipse E3, SAEMAS can now monitor, in real time, all 20 units in the water storage system from Sertãozinho, a municipality in Brazil. Operators are instantly briefed about any occurrences and can act on it very quickly; before the adoption of Elipse E3, system monitoring happened locally and not remotely, therefore what now can be done within a split second usually took hours to be resolved. “The data and reports generated by E3 allow us to diagnose and fix any issues much more easily; we no longer need to displace maintenance teams to the field only for monitoring purposes,” says Leandro Espinoza, chemist at SAEMAS. According to Espinoza, the solution has also allowed the company to determine the need for elevating the power factor of the water pumps; this benefit responds directly to this automation’s main purpose, which is reducing water and energy waste in the system. “Thanks to Elipse E3, we were able to ascertain a new power factor for the water pumps; acting on it will save us, in the future, around U$ 5,000 per month,” he says. Unit performances are analyzed via charts, which can also be exported to Excel or PDF. Systems Integrator: Alfacomp Automação Industrial Ltda.